Researchers say bioinspired vortex generators increase airfoil lift, decrease drag. 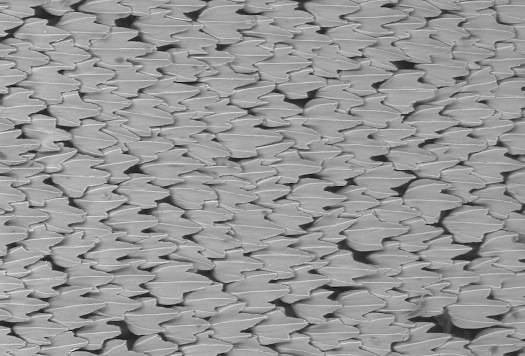 A team of evolutionary biologists and engineers at Harvard University, in collaboration with colleagues from the University of South Carolina, have shed light on a decades-old mystery about shark skin and, in the process, demonstrated a new, bioinspired structure that could improve the aerodynamic performance of planes, wind turbines, drones, and cars. The research is published in the Journal of the Royal Society Interface. Sharks and airplanes aren't actually all that different. Both are designed to move efficiently through fluid (water and air), using the shape of their bodies to generate lift and decrease drag. The difference is, sharks have about a 400 million-year head start on the design process. To help test that hypothesis, the researchers collaborated with a team of engineers from the Harvard John A. Paulson School of Engineering and Applied Sciences (SEAS). For inspiration, they turned to the shortfin mako, the fastest shark in the world. The mako's denticles have three raised ridges, like a trident. Using micro-CT scanning, the team imaged and modeled the denticles in three dimensions. Next, they 3D-printed the shapes on the surface of a wing with a curved aerodynamic cross-section, known as an airfoil. Even if you don't know what a vortex generator is, you've seen one in action. Cars and planes are equipped with these small, passive devices designed to alter the air flow over the surface of a moving object to make it more aerodynamic. Most vortex generators in the field today have a simple, blade-like design. 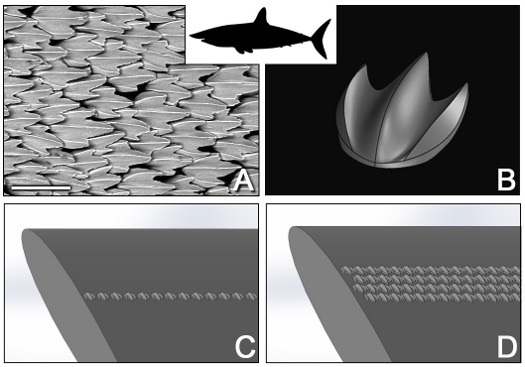 "This research not only outlines a novel shape for vortex generators but also provides insight into the role of complex and potentially multifunctional shark denticles," said Lauder. The research was co-authored by James Weaver of the Wyss Institute for Biologically Inspired Engineering at Harvard, and Hossein Haj-Hariri, Dean of Engineering and Computing at the University of South Carolina. This research was supported by the Office of Naval Research and the National Science Foundation.